She’s left brained, he’s right brained – a perfect combo! Heather and Rafael Chandler are the masterminds behind Whole Brain Escape, a locally-grown business in the heart of Apex, NC. 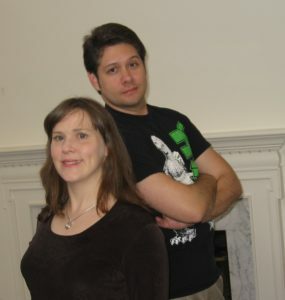 We both love games and puzzles, and have devoted our careers to creating interactive entertainment. All of our rooms and puzzles were conceived and built by Rafael. We take great pride in creating an experience that will exercise both sides of your brain. Heather Chandler (Left Brain) is a veteran producer with over 20 years of experience in the video game industry. She’s led teams at Epic Games, Electronic Arts, Ubisoft, and Activision; most recently she was Senior Producer on Fortnite. Aside from Fortnite, she has worked on over 35 games, including Never Alone, Star Trek Rivals, Kingdoms of Amalur: Reckoning, and several games in the Ghost Recon series. Rafael Chandler (Right Brain) is a video game writer and story designer; he’s worked for Sony, Sega, Ubisoft, Kabam, and Gameloft. In addition, he’s lectured on interactive narrative at the Game Writers Conference, the Montreal International Game Summit, and the Russian Game Developers Conference in Moscow. In his spare time, he writes novels: Mask Beneath Her Face, The Astounding Antagonists, Hexcommunicated, and Dracula: The Modern Prometheus.